Macquarie Island lies in the southwest Pacific Ocean, about half-way between New Zealand and Antarctica. Politically a part of Tasmania, Australia, since 1900, it became a Tasmanian State Reserve in 1978, and a World Heritage Site in 1997. The island is home to the entire royal penguin population during their annual nesting season. Ecologically, the island is part of the Antipodes Subantarctic Islands tundra ecoregion. From when it was first discovered, Macquarie Island was also of interest to scientists. The Russian expedition led by Thaddeus von Bellinghausen collected flora and fauna on the island in 1820. Charles Wilkes’s US Exploring Expedition and two New Zealand scientists, JH Scott and A Hamilton, followed. Joseph Burton spent three and a half years from 1896 collecting specimens while working with oiling parties on the island. Scientists with Captain Robert Scott in 1901 and Sir Ernest Shackleton in 1909 also collected specimens on the island. In 1911, Australia’s Sir Douglas Mawson established the island’s first scientific station. In addition to conducting geomagnetic observations and mapping the island, studies were made of the island’s botany, zoology, meteorology and geology. The Macquarie Island expedition also established the first radio link between Australia and Antarctica by setting up a radio relay station on Wireless Hill that could communicate with both Mawson’s main expedition group at Commonwealth Bay, and Australia. 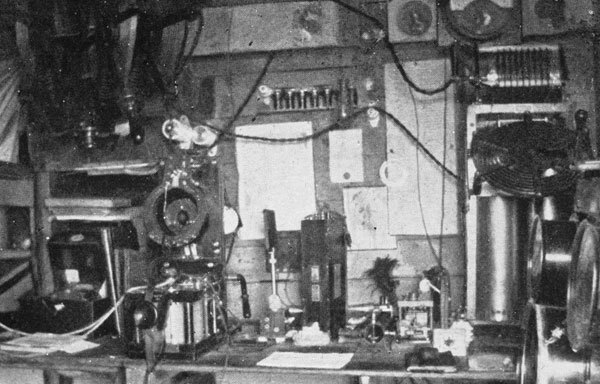 The telegraphists, Charles Sandell and Arthur Sawyer, used a German-made Telefunken 1.5 kilowatt spark-gap transmitter. The first successful transmissions from Wireless Hill had been made on 17 January, the day Captain Scott and his party reached the South Pole, although the distance was not great, as the receiving station was also on Macquarie Island. 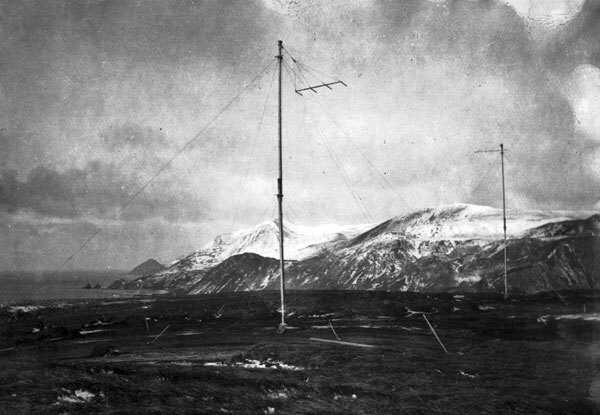 Hobart Radio came into service in March 1912, and the team at Macquarie Island learnt the disappointing news that Amundsen had arrived in Hobart, after being the first to reach the pole. The Wireless Hill station was quite successful sending nightly weather reports to Wellington, New Zealand, but it was not until April 1913 that communication with Commonwealth Bay was finally established. Radio operation needed power, so an engine house was built a short distance from the radio shack on the top of Wireless Hill. This was known as ‘De Dion House’, as the engine that drove the generator was a French water-cooled De Dion-Bouton. The De Dion engine was the world’s first internal combustion engine to be manufactured in large numbers from 1895, and set the design standards for the first motorcycle and car engines. At the end of the year, the station was taken over by the Australian Government meteorological service, from the Mawson Antarctic Expedition. Macquarie wireless station closed on 14 October. 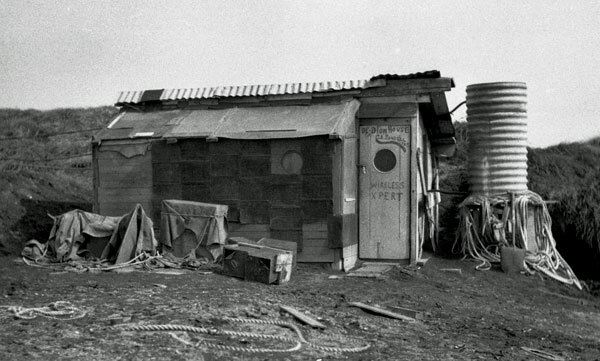 In December, Douglas Mawson visited the Wireless Hill station during the British and New Zealand Antarctic Research Expedition (BANZARE) and found the De Dion engine house and wireless shack were still intact. However, Mawson’s diary entry for 2 December states ‘There was little of the equipment inside of any use, and such as still useable is antiquated, so of no practical value’. Awarua Radio began working Macquarie Island VJM. The Australian Government announced it would close the permanent Macquarie Island research station, then reversed that decision a few days later following protests from scientists and Tasmanian politicians. 1. Morgan, A., The Wireless Crew, The Science Observer, vol 4, p 2.